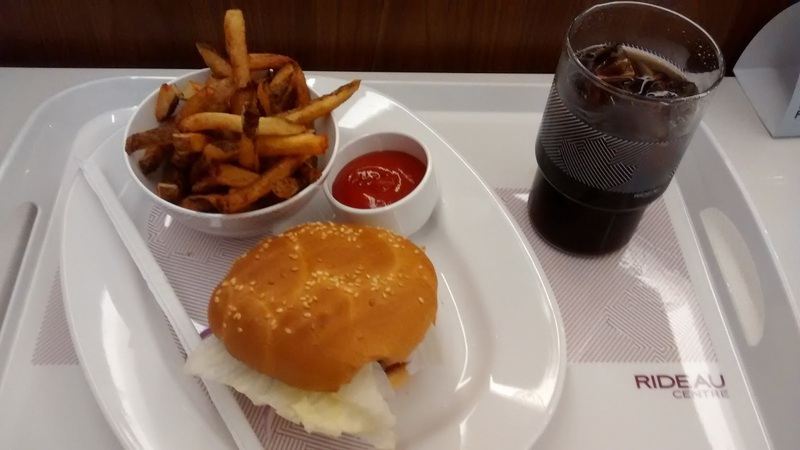 Friday August 1st at 11 A.M. saw the grand opening of Cadillac Fairview's Rideau Centre Food Court. I arrived at 11:20 after letting the festivities die down and the grand unveiling by Cadillac Fairview and Rideau Centre Mall big wigs die down. I really didn't need to see any more marketing pomp & circumstance considering I'd already been to a preview of the food court for just that purpose on Wednesday. My first stop was Big Smoke Burger (50 Rideau Street, Ottawa), where I joined the decent of line of customers averaging about 12 at any one time. Yes, it was a decent length of line but it moved pretty steadily with only a few hiccups here and there. These hiccups will be a theme for the rest of the visit and hopefully will be fixed over the coming days. The first step, after joining the line is ordering. With two cash registers and one common line this process moves quickly and orderly. The cashier asks what you would like to order and makes sure all items are correctly entered into the computer. Similar to Starbucks, Big Smoke Burger takes your name so you know which order is yours that comes out the other end. 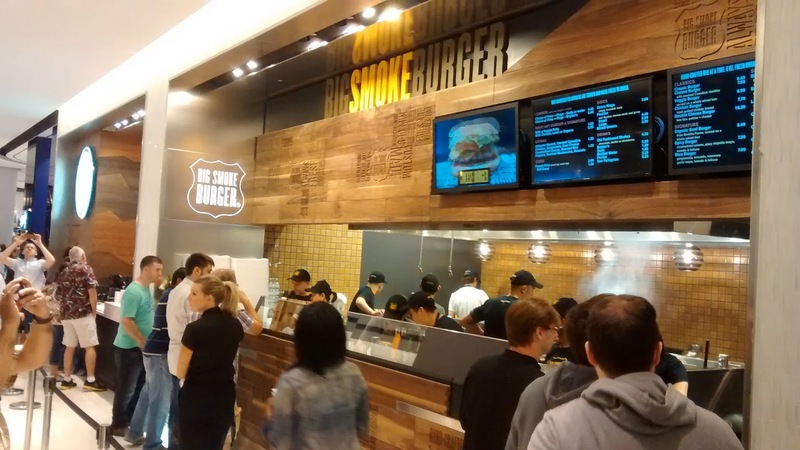 Big Smoke Burger Rideau Centre Food Court Storefront on opening day. Next, customers move along watching as the team of over 12 employees move your order from grill, to topping to putting together your plate. 12 employees? Yes Big Smoke Burger was ready for the crush of prospective customers to be served. Kudos on being prepared with more than enough manpower. The last step is for the employee putting together the order to finish up and hand you your order with a smile. This is where another hiccup occurs on opening day at Big Smoke Burger. Apparently, on the receipts the team uses to put together custom orders drink types were not included. This is an issue considering the cash register where the order is taken is at the opposite end of your order unlike at many fast food locations like Wendy's or McDonald's where the cashier looks after the drinks. A dumbfounded look on the query of "I ordered a Coke with the combo, is it coming soon?" was a little puzzling. This was until the manager, further up the production line indicated that the computer system needs to be adjusted and asked the cashiers to write the drink orders on the receipts before passing them on. My drink arrived within 30 seconds and I was off. I sat down with my tray with plate, drink and other condiment holders. The quick difference from a traditional food court was the real glass, china plate, bowl for fries and a condiment dish for the ketchup. Not sure why the fries required it's own bowl as the burger did come on a plate. The Rideau Centre is supposedly trying to reduce the vast amounts of trash from that emanates from food court operations. One of the major ways to do this is by using dishes. Sure fries traditionally come in separate packaging within a food court, but not in a traditional restaurant setting on average. So perhaps a reduction in dishes requiring to be washed and in turn the amount of water used during the dish washing process. The burger was my first target. Optically it didn't look really good with the garnishes present. The whole burger look slap-dashed together with the lettuce leaf hanging over the edge especially. Add to this the first bight tasted like the burger had been on the grill a little too long. Perhaps, again, this was an opening day hiccup but not a great introduction for a restaurant. The fries were the popular put the entire potato through the slicer. The fries were decently cooked with a nice golden brown with a soft texture. Accompanied with a dash of ketchup these fries were excellent. I dropped my empty dishes and tray off at the nearest counter to a smiling Rideau Centre lady quickly and easily. Overall, the Big Smoke Burger understandingly needs to iron out a few opening day issues such as overcooking food and fulfilling drink orders. Price wise at $12.45, including taxes, for a meal this size seems a little questionable. The quality attempt is probably there, after ironing out the overcooking of the burger issue. Sure this is a mall food court and prices typically are a little higher. But for a supposed premium burger and quantity of fries Five Guys Burgers & Fries is probably a better deal. There is promise in quality at Big Smoke Burger, the systems just need a little refinement. Finally, the new plate, cutlery and glass system the Rideau Centre has going on will be interesting to observe over the coming weeks and months. Will these designer dishes gradually dissappear due to the theft and the mall return to trash? Will prices increase to compensate for the manpower to collect and wash the dishes? Will customers continue to take the trays to the counter to be processed and will these counters be properly staffed? It will be interesting to see how the Rideau Centre answers these questions in time.